July is almost half over, but we still have time for our program of the month: Spiders & Flies. You play a growing Venus flytrap that is searching for flies and special bugs. 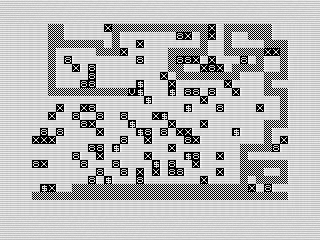 Use the ZX81 arrow keys to move around: 5, 6, 7, and 8. But be careful. Don�t eat the spiders lurking about or accidentally eat yourself. It�s a super easy game so you have no excuse for not trying it out. Spiders & Flies is a bit like he classic snake games except that your �stem� doesn�t shorten. Instead I used a timer, basically a loop, to end each level. Since I based the timer on moves, you can sit in one spot if you get stuck. Of course, you won�t get as many that way. A nice fix would be to prevent you from doing that, say a sit timer that you would �wilt� if you don�t eat for so long. Just move around and eat the inverted eights, flies worth 10 points, and dollar signs, special bugs worth a random amount. Since you�re a plant, you always start at the bottom. You grow towards your prey. Sadly, your prey is static so you�re really just finding the best path to eat as many bugs before the timer runs out. Once it does, the program clears the screen and you do it again. Like I mentioned earlier, it is easy. From a programming perspective, if you�ve keeping up with my articles there isn�t much new here. This game is really a blending of ideas and techniques from other games. That isn�t a bad thing. Programming is really all about finding new ways to use old code. The trick is how to put the elements together to make something new. I�ve used tails before, even if technical it is a stem in this version. The screen creation, movement, collision checks, etc. are all standard routines. Even so,the game has a nice look and feel. If you thing about it, modern-day engines like Unreal and Source are nothing but building blocks that developers plow their ideas into. Although I'm not building a standard engine with all the bells and whistles, it is an engine of sorts and I add or drop routines into it depending on the game. I actually like the overall concept of this game. However, I can see a few improvements that might make it a little better. I mentioned the timer already, but sadly changing it would probably mean moving this program into MCODER as the test would really slow down the movement. Although, if I did that I could add some movement to the bugs. The game does get a bit boring as designed, so adding some more challenges would help increase the difficulty. Most likely more spiders. Doing so should make it a bit more enjoyable. Not too much mind you, just enough to make it fun. Until next month. Avoid the RAM wobble! Note that this program was typed in using Zed Ex. I adjusted the keys so you could use the built-in game keyboard to play.